One of the keys to a successful wardrobe is choosing clothes which are versatile, you know, those pieces which can be – as I so often say – dressed up and dressed down or transition you between seasons. You will find it easier to pick an outfit with more options available to you if your wardrobe contains items which can be styled to suit the occasion rather than completely compartmentalised into day/evening/work/weekend. You’ll also get more wear from your clothes, and while cost-per-wear isn’t the be all and end all, it makes sense to spend on the items you wear and wear – the foundations if you will – so thinking about how versatile something is before you buy it is a minute or two well spent. As we move further into autumn you may be thinking about putting those summer dresses into hibernation and hitting the shops for your new season wardrobe but before you do, take another look at those warm-weather favourites and see if you can’t take them stylishly into the cooler months. Roll necks are not only practical and great for layering they were also a big hit on the autumn/winter catwalks so you can keep warm while rocking a key trend for the season. Layer your lighter weight sleeveless summer dresses over long sleeve tops to take them into autumn. Don’t be scared to try over-the-knee boots. 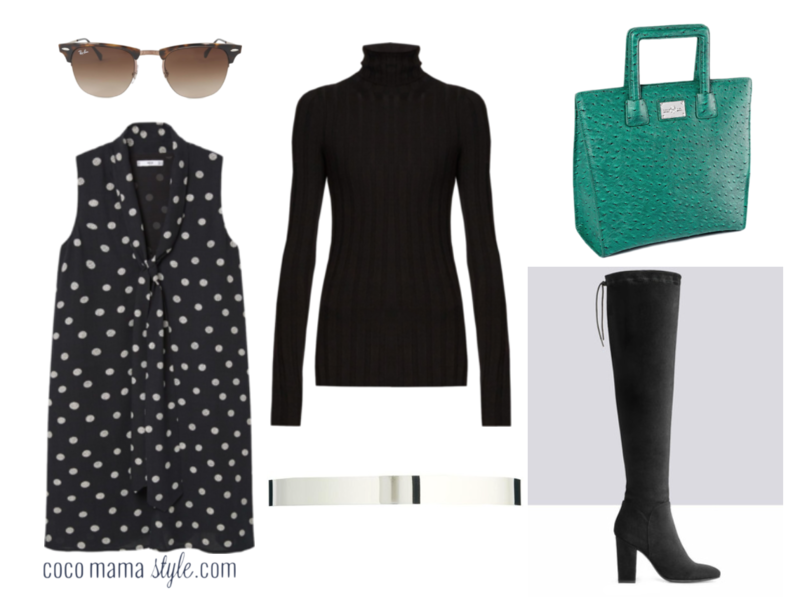 For a less, ahem, racy look wear over super skinny jeans with a chunky knit, try with a slouchy sweater dress or as seen here with a roll neck layered under a dress where the hem sits no more than an inch or so above the top lot the boots. Wide, cinched waists were another big detail, quite literally, on the runways for this season. We did wide belts several years ago, we went back to skinny and now it’s time to go big again! Look for leather obi belts to tie around your waist or metal plate belts to keep it current and update the look from back in the day. Thank you for all the style tips-I am a completely hopeless shopper and never know what to buy or wear so your updates are very helpful and much appreciated!